You can support End-of-Life University with your donations on Patreon.com. Click here if you agree to receive emails from Karen Wyatt MD. Throughout my career as a doctor working with patients in hospitals, nursing homes and hospices I have had the opportunity to witness the dying process on many occasions. I have learned that even though the outcome of this process is always the same—the death of the physical body—there are many different ways to die. In fact, each individual has a unique experience at the end of life. For some patients death is a welcome ending to a life well-lived, for others death is reluctantly accepted even though they don’t feel ready to let go of life, and some approach death kicking and screaming all the way. They “rage against the dying of the light” as observed by poet Dylan Thomas in a poem he wrote for his dying father. We live in a society where death is still a taboo subject. Many people go through life without consciously considering the fact that they will die one day and are shocked when they receive the news that death is approaching. Since they’ve never thought about death they have no idea what type of care they would like to receive at the end of life and find it difficult to make clear choices for themselves while dealing with the stress and fear caused by a terminal diagnosis. Recommendation #1: Begin to think about the reality that every living thing on this planet eventually dies and then spend time contemplating the fact that you too will die one day. The Bhutanese people have a practice of thinking about death 5 times a day and have been named “the happiest people” on earth. So make a point of thinking of death on a regular basis, perhaps reading books and watching films to help you get more comfortable with the idea of death. Those who haven’t thought about death also have not made plans for the end of life or completed an advance directive. 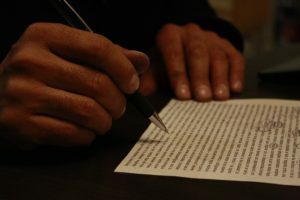 A recent study has shown that two out of three Americans have NOT put their end-of-life wishes in writing, which means they are more likely to receive expensive and unwanted care during their last days. According to a survey by the CDC, most patients do not want to die in a hospital attached to machines, but that is only possible if they have made the decision ahead of time and completed an advance directive. Recommendation #2: Start by completing your own paperwork now for the end of life, such as a living will, estate plan, and funeral plan. Think through the options for care that might be available to you and formulate your own opinions—what is important to you? What are your wishes for your last days on earth? During a healthcare crisis many patients are unable to speak up for themselves about their end-of-life choices. If family members don’t know the patient’s wishes they will find it difficult to make appropriate decisions for their loved one on a moment’s notice. In my experience, uninformed family members are more likely to defer to medical providers when end-of-life decisions must be made and are also likely to experience guilt and conflict with one another over those decisions. Recommendation #3: Once you’ve decided what you want for yourself at the end of life it is vitally important that you have conversations with everyone in your life that may be involved in making decisions for you. The more you talk about it the more you will create peace for yourself and for your loved ones when the time comes. people die the way they’ve lived. I have observed that patients who have held onto bitterness and disappointment about life tend to be unhappy during the dying process as well. Since they had never learned how to be at peace with the circumstances of life, when death is near they remain angry and inconsolable. Woody Allen wrote for the movie Annie Hall that life is “full of loneliness, and misery, and suffering, and unhappiness, and it’s all over much too quickly.” This epitomizes the attitude of the unhappy patient at the end of life, who hated every moment of being alive but is now furious that it is coming to an end. Recommendation #4: The antidote to this type of misery is to learn to find happiness within yourself long before life reaches its end. Each of us is responsible for creating our own joy in life, even if life hasn’t turned out as we have hoped. Conduct your own “experiment” and figure out what makes you happy—then cultivate those things in your daily life and you will look back one day to find that you have led a life filled with joy. Many of my dying patients have been ravaged by feelings of guilt and remorse over events of the past. They either have felt a deep need to make amends for some previous action of their own or they have been burning inside with resentment toward another person. Those who have not found their way to forgiveness have remained in this painful state of guilt and blame until their last breath. Recommendation #5: It is never too early to start working on letting go of old wounds so that you can avoid the overwhelming negativity of resentment at the end of life. Develop your own daily practice of forgiveness and you will find much more peace in your life now, as well as during your last days. Some of my patients have been angry about the fact that they were dying because they spent much of their lives doing things they believed would “prevent” them from dying. They devoted themselves to a restrictive diet or intense workout plan or even strict religious practices in order to live life “the right way” and avoid something “bad” from happening to them. When they ultimately had to face the fact that they were going to die anyway they felt cheated and betrayed. They had fallen for a false belief that their healthy habits would somehow entitle them to avoid death. Recommendation #6: It is important to come to terms with death, and your fear of it, earlier in life so that you don’t waste time and energy trying to prevent what is inevitable. Develop a practice of thinking about death as a necessary part of the life cycle and something not to be feared, but to be respected. Journaling, prayer and meditation can be helpful tools as long as they focus on the reality of death and are not serving as bargaining chips in a futile attempt to avoid death. Those patients who have avoided thinking about death generally have also not taken time to educate themselves about their own health issues. Without knowledge and information as a tool to guide decisions, they are disempowered when they must engage with the medical system. They don’t know what questions to ask or what alternatives to explore so they simply place all decision-making in the hands of their care providers. These patients may end up with more treatment than they want and encounter more suffering than necessary because they didn’t have the confidence and information they needed to help determine their own course. Recommendation #7: While doctors are well-educated about disease and treatment modalities, they know very little about you, your life path and what options might be best for you. When you receive a chronic or terminal diagnosis it is your responsibility to learn as much as you can about your options by asking questions, reading and studying, and requesting second opinions. You are the only expert on the subject of “you” so don’t give up your power to another person, no matter how impressed you are with their credentials. In summary, by looking at why some people don’t die in peace we have seen what is necessary in order to have a peaceful death. Being consciously aware of your mortality, working on your past issues, making plans and completing paperwork for the end of life, communicating with loved ones, and empowering yourself with knowledge are all important steps toward an end of life that offers comfort rather than chaos. But it requires work and dedication on your part to prepare now for what will be coming in the future. Of course there are other reasons why some people don’t die in peace: they may have pain and other symptoms that haven’t been managed well, they may be alone and have no one to comfort them, they may simply be overwhelmed by the hand that life has dealt to them. But these are issues that may be addressed by finding support from hospice or palliative care workers, if that type of care is available (and reliable) in the community, though there are reports that hospice staffs are stretched too thin in some areas and care at times falls short of what it should be. But you can improve your own chances of getting good end-of-life care by doing your own inner work, becoming an advocate for hospice and palliative care in your community, holding those organizations accountable to best-practice standards, and supporting causes that help people find peace in their lives. It’s never too early to start! The Aramaic word for grief can also mean “to wander.” When I was left wandering and bewildered after the death of my niece a small ritual helped me find my way again. A few months ago my niece died of breast cancer at the young age of 47. I was somewhat prepared for her death because of her 14-year journey with cancer and the inevitable decline she had been experiencing for several months. Yet in reality death always arrives like a lightning bolt that pierces to the core. There is no way to prepare for death’s appearance or to be unmoved by the jolt: your loved one is next to you in one moment and then gone after a single breath. You don’t know you are at the end until the end has already passed. So the news of Tracey’s death hit me hard with a mixture of emotions—disbelief that she could really be dead at such a young age, pain for her son and her parents as they coped with this loss, guilt that I hadn’t done more to help, and a trace of relief that finally there was no more uncertainty and no more agonizing over what suffering the next hour or the next day would bring to her. Her journey here was finished. 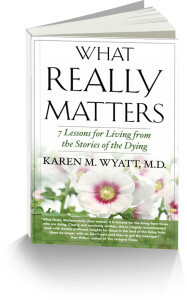 As life would have it, with its curious synchronicities and juxtapositions, I was scheduled to do an interview with two women who had written a guidebook to end-of-life rituals just a few hours after news of Tracey’s death reached me. I didn’t even consider postponing our conversation because I knew that this timing, though difficult, was perfect. 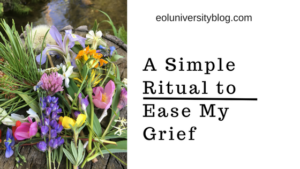 My guests, Donna Belk and Kateyanne Unillisi, talked about the importance of rituals for making sense of life’s tragedies and painful events and they shared their suggestions for creating our own simple rituals. I understood deeply the importance of this subject and that I needed to somehow find a way to mark this day with some special ceremony, though I had no idea where to begin. The next morning I took a long walk on a path next to the Blue River and thought about Tracey. I was filled with regrets – Why hadn’t I visited her one last time? Why hadn’t I called her for that talk about forgiveness that I knew she wanted to have? Why hadn’t I been there more for my brother? In that moment I was surrounded by joy, peace and love. 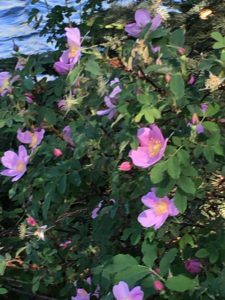 I looked down and saw beautiful flowers I hadn’t noticed before at the side of the path: fragrant wild roses in bright pink, Tracey’s favorite color. I instantly knew what to do next and asked Tracey to join me. I began to gather wildflowers from the banks of the river and was surprised by the variety I found growing there when I really stopped to look: mountain lupine, bluebells, yellow daisies, poppies, chicory, cinquefoil, wild geranium, blue flax, columbine and more. By the time I reached a small stream that flowed gently into the rushing river I had a handful of blossoms of many colors. 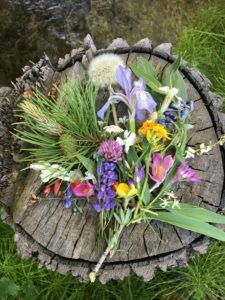 I spread them out on a tree stump to create a mandala of sorts—an array of beauty and a reminder that life changes constantly but ultimately continues on. I said a prayer for Tracey and for all of our broken hearts that were missing her so dearly on that day. Then I dropped each blossom—one at a time—into the stream and watched it drift gently away. With each flower that tumbled into the stream I felt a lessening of the burden of grief and a gradual influx of peace. And all the while I heard the faintest hint of laughter floating on the breeze. As part of an ongoing series on various religious and cultural perspectives on death, I recently interviewed a priest about the Catholic approach to dying and after-death care. During the interview he shared with our audience a letter that had been written recently by a fellow monk from his monastery, Father Mark, who was dying of stomach cancer. That letter was a poignant and instructive guide for how to approach death with three virtues that Father Mark said he valued most in his last days on earth: comfort, grace and gratitude. Father Mark, who has subsequently died, agreed to share his words and his wisdom with people far and wide, with a humble wish that others might be helped by reading about his experience. Father Mark interpreted this quote from Saint Benedict quite literally as he recommended a meditative approach to death to help ease fear and live fully. He himself was able to find joy and positivity even within the natural anxiety that comes from facing death full on and acknowledging its inevitability. Be willing to hear the truth. Father Mark described unflinchingly how his doctors told him truthfully that there was nothing more they could do for him. He listened to their prognosis and embraced the limited time left for his life without fear. Let go of curative treatment at the right time. When it was clear that the cancer was spreading quickly Father Mark recognized that it was time to stop treatment and focus on saying goodbye, which was the motivation for writing the letter. Father Mark described how helpful his palliative caregivers were in guiding his decisions for the last chapter of his life. With their advice he expressed his love to others, made amends and planned meaningful activities while he still had enough energy to pursue them. In his letter Father Mark expressed his deep gratitude for life itself, love, his community, career, and spiritual life. He looked back upon his years of life as a blessing filled with rich meaning and growth. Because of his belief in an afterlife, Father Mark could express his sadness for all that was coming to an end in his physical existence but also look forward to something more that would continue on. His great faith allowed him to embrace his death with wonder and awe as he prepared for whatever lies next. Through his thoughtful words Father Mark was able to translate his dying experience into meaningful advice that can change the perspective of all who read it from fear to peaceful acceptance of death. Indeed Father Mark accomplished his goal of achieving comfort, grace and gratitude in his own final days and also transmitted those three virtues to each of us who have received them. These are the words we were born to hear; this is the lesson we came here to learn: embrace life fully and look death in the face every day. Thank you Father Mark for so generously sharing your last days and thoughts of life with us and for continuing, even in your death, to be an enlightened teacher. Get Dr. Wyatt’s award-winning book on Amazon or Kobo.